It's the only mode with the cap. Crackdown 3 is out now, and players have already started tearing across the city. As well as the singleplayer campaign, you can team up with a mate and cause some mayhem in co-op, but there's an unexpected caveat: the co-op campaign is locked at 30fps, even when both players are on PC. Several threads have already popped up on Reddit, with players a bit confused. 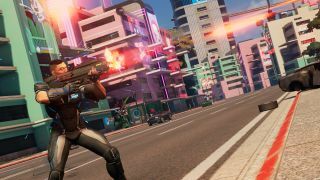 The singleplayer campaign doesn't have the same restrictions—you can unlock the framerate—and it doesn't seem to have anything to do with Crackdown having crossplay. Forza Horizon 4 and Sea of Thieves, for instance, both have uncapped framerates. Microsoft claimed that the framerate wouldn't be locked in multiplayer, and that it had made an extra effort to ensure the PC version felt like a full-featured PC game. Wrecking Crew, the 5v5 competitive multiplayer mode, isn't capped, which makes the co-op mode a strange outlier. I've reached out to Microsoft to find out if this is a bug or working as intended. Expect our review of Crackdown 3 in the near future.